At the heart of children's literature are children, so what better way to celebrate their creativity than by putting together an entire book written by New York City students? 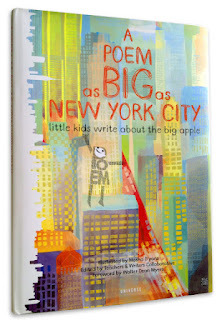 A POEM AS BIG AS NEW YORK CITY was organized by the Teachers & Writers Collaborative, a 45-year old nonprofit organization that offers creative writing programs for students and teachers throughout the five boroughs. What they did is not only inspiring, but it's a reminder of what young people are capable of. For two years, the Teachers & Writers Collaborative implemented a curriculum framework that served as a guide for students to write in poetry workshops. Students were instructed to imagine the poem as a character, traveling through the city and observing all it has to offer. And the result is an entire book that's a kid's-eye view of The Big Apple, Brooklyn, Staten Island, the subway, the Statue of Liberty and more. I was born and raised a New Yorker and this book transplanted me back into the heart of the city. The sights, sounds and images are amazing and I can only imagine the creativity it took to put this entire project together. The poem is a great read, and the illustrations by Masha D'yans are truly unique. All Content Copyright. LoriCalabrese. All rights reserved. Simple theme. Powered by Blogger.